Following the huge success of its first open sales on Wednesday, the Lenovo Vibe K5 Plus will be up for its second open sales on March 30. The Lenovo Vibe K5 Plus open sales will be for a limited stock only and will take place at 12:00 noon. While the open sales is very much like the flash sale, it is without registration as with the case of the latter. But again, it is a matter of first-come first-serve basis and with limited stocks, just like flash sales. 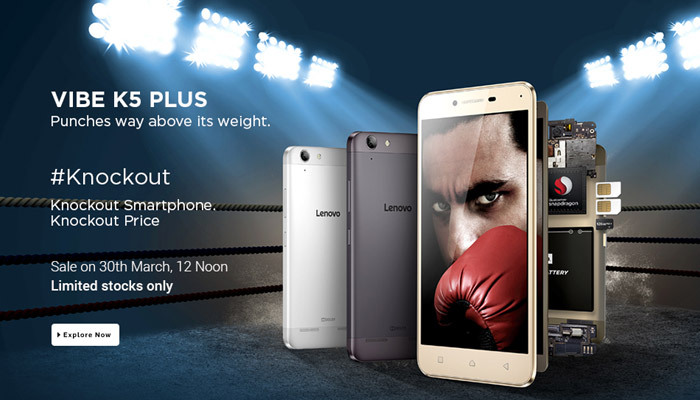 The Lenovo Vibe K5 Plus, which was recently launched in India, has been competitively priced at Rs 8,499 only. The smartphone sports a 5-inch IPS LCD Full HD display with a 1080 x 1920 pixel resolution and 441ppi. It is powered by a 1.5 GHz Qualcomm Snapdragon 616 processor with Adreno 405 GPU and 2GB RAM. It also comes with 16GB internal storage that can be expanded up to 128GB via a microSD card. It is also equipped with a 13MP rear camera and a 5MP front-facing camera. Priced at just Rs 8,499, the Lenovo Vibe K5 Plus is regarded as one of the best Rs 10,000 smartphone.